When I first reviewed Spyderco knives, I didn't know much, but I was passionate about them. Now it's been years since then, and my wife and I are now true Spyderco knife fanatics. As much as we have expanded our horizons to using other types of knives from other companies too, we still have a special place for the Spyderco knives in our hearts. We own a great collection of these knives just because we love them and they deserve to be in our home. To hold a Best Spyderco Knife is to experience true quality in the palm of your hand. These knives have more than thirty years of research and growth behind them to create the finest steel blades this century has ever seen. They are ergonomically designed with admirable handles and strong blade. I want to share with you what I know and have learned over the years about how to choose the best Spyderco knife and which ones are topping the bests list. This is the everyman's knife. It is one of the most popular pocket knives today, and one of the best I've ever come across. You will find it in the pockets of men who value and enjoy quality craftsmanship for the absolutely good price. One thing I love about this knife is that it measures amazingly well against more expensive knives in the same bracket. 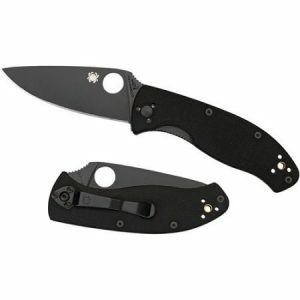 Even better, Spyderco Tenacious Folding Knife is made from some of the best materials a pocket knife can be made from. One of such materials is the 8CR13MOV blade steel and the excellent G-10 handle. It's 3.39 inches of length fits well into a normal sized pocket. When you open it, it has an overall length of 7.76 inches, which I find convenient. Since it also has chromium that deflects corrosion and rust, these knives have stainless steel blades. You will love its tip, which is innovatively shaped to be a drop point. That makes the knife good for slicing but not so much for stabbing hard objects. What you will be having with this knife is something that is technologically designed to serve its intended purpose. Every time I look at this knife I wonder how whoever designed managed to create such an amazing pocket knife. It is a masterpiece in the pocket knife world. It is a perfectly sized knife designed to give you an easy time to use and to carry around in your pocket. What makes it even better is how it cuts like a laser. Since one couldn't be enough for an adventurous person like me, I decided to own a collection of them, and they are serving me well. This is one of the best knives Spyderco has ever released. It is unique in its kind, and it's slightly different from the other models because it is lightweight compared to those models. I'm amazed by the many colors and handle options available, which present you with options so that you can choose the color that best suits your needs and style. These knives also have full-flat blades that maximize their effectiveness in cutting stuff. The handle is made of fiberglass reinforced handles that are available in blue, brown, gray, purple, or green for easy organization when storing them. Once you understand the special ability of this knife, you'll want it so badly. This is a sleek piece of innovation made using the best and highest quality materials. It folds nice and easy, and you can carry it with you to wherever you feel necessary. Because it is lightweight and compact in design, this knife gives you an easy time to use, to store, and to carry with you. It features improved grip and control so that when you are using it, you feel totally in control of the cutting. Whatever you'll be cutting it with cut through nicely. The blade designed in such a way that it slices through the object just like you'd want it to. I love the fact this knife is engineered to include a full flat-ground blade that provides enhanced edge geometry and cutting precision. Then when it comes to the durability of the knife, there is no need to worry since this high-quality pocket knife is made from some of the best materials so that it lasts longer even with constant use. It is amazing to have a knife that will stay with you for as long as you may want. Knife enthusiast knows how to pick nice models because they know that they must look for the features that impress them the most. One of the reasons why I have several of these knives in my collection is because my wife and I can't think of a better life than that where these knives are present.I love the fact that they are part of our lives, and they help us carry out daily cutting or carving chores. They are very efficient and convenient in such a way that they make our life a lot easier both in the house and in the outdoors. You've got to be an adventurous person, and sometimes you need such cool knives to improve your life. You can use it to cut or carve anything. Its palm size nature makes it the perfect knife to carry with you to places away from home, just in case you will need a knife to cut something to help make your life better. Versatility in a pocket knife makes it even better, and love how I can use this model for different cutting tasks. It can do most cuttings, and it does them excellently. There are lots of features to admire in the Spyderco Endura4. This is a nice Spyderco knife that offers what the big boys offer but at a cheaper price. It's like Christmas come early. It gives you a lot of cutting power, more than anything at its price range. I love the color of the handle and the quality of the blade. Even before you use it, you can tell that it is a very powerful and excellent piece of innovation. You will not need to use too much energy to cut with this knife since it cuts through anything with so much ease. One of the things I like about all Spyderco is that each model is designed to be unique in its way, and that's exactly what this model represents. It stays safely in the pocket and helps with different types of cuttings that happen in our daily lives. The quality of both its blade and handle is excellent. The weight is also well balanced to give you maximum control when cutting something. It makes you make highly precise cuts for a better production. When you want to buy the best Spyderco knife, there are a few things you need to put in mind. These factors will guide you into making the correct choice so that you avoid paying for what will make you regret later. A knife can only be made from carbon steel or stainless steel. From these two quality materials, you can always choose the one that is best for you. Both materials have their unique strengths and shortfalls, and that is what we can use to determine which knife is the best for you. Carbon steel makes classy knives because it is unyielding and can maintain sharpness for longer. However, it has a downside too. It is prone to rust. So, no material is perfect, but you will for sure get something for yourself. Whether it is a folding knife or fixed blade knife, it varies on the shape. Maybe it is made in a unique way. That uniqueness is what makes the knife nice and classy. Point and cutting edge will vary from knife to knife and you need to be careful when you are selecting on this quality. A knife's point or tip should be robust enough to resist breakage when it falls or hit the wall. You can choose your knife according to the type of blade point it has. The sharp point of the knife is either serrated or plain. Most knives have a plain edge, and that is what most users are used to. But remember, serrated edges can be stylish and classy. The serrated edge is toothed and somehow looks like a saw. This style is new but somehow effective. This depends with what you want to use the knife for, or how you want to use it. If you want a knife that is portable, a folding knife is the best. It is easy to fold in whenever you want to store it. It also makes it safer to store. With this guide, I hope you will find the best Spyderco knife for you. With just these few steps, you will for sure find it from this list. Take your time to choose wisely. All these five products are the best in their unique ways.